Pair of complete disc brake assemblies. One caliper is loose, appears to be 71-72. Rebuildable set good for disc brake conversion with original parts. Shipping based on buyers location. May have to ship in 2 separate boxes due to weight. Will ship anywhere within the USA. Last edited by bill440rt; 02/07/19 10:08 PM. Available for your lids 15.00 free shipping! Last edited by Crycho; 01/22/19 05:08 PM. 71-74 rear speaker harness, used, part #2889614, $25. Call Steve 810-629-1097. Last edited by Memongo; 01/24/19 02:48 AM. 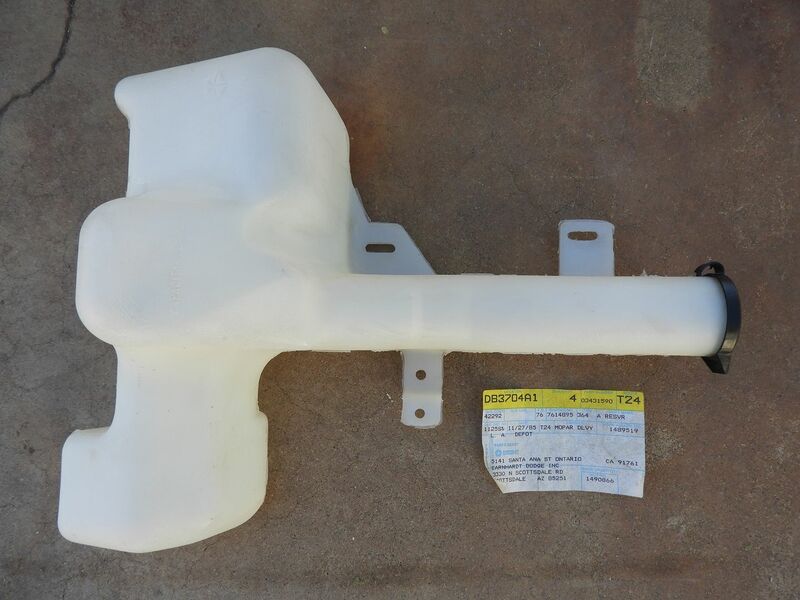 73-74 windshield washer reservoir with washer pump, part #3431671, used, $35. Call Steve 810-629-1097. 71-74 Tuff wheel no horn button, excellent condition, part #4039FX9, $400. B body adapter also available, $150. Call Steve, 810-629-1097. Last edited by Memongo; 02/13/19 06:44 AM. 72-73 B body seat belt warning relay, used, part # 3588588, $20. Call Steve, 810-629-1097. NOS Lug Nuts, 1/2 RH. This is a set of 5 factory NOS chrome lug nuts that are 100% correct for your 60's and 70's Mopar Muscle Car. These are different from the reproductions. The judges know! Last edited by MuscleMopars; 01/24/19 10:01 PM. '71 - '72 E/B-body power brake booster assembly. Should be correct for 71-72 E-body & '71-'74 B body cars. Includes booster, firewall reinforcement plate, master cylinder, wire harness bracket, and not seen in the photo but the black plastic check valve is also on it. Booster does have surface rust in spots, should clean up nice. Not heavily pitted. No dents. The original gold cad plating can also be seen on the backside in one area. Booster has not been tested so it is being presented as a core. More pics available. Price is $95 plus shipping thru FedEx. Shipping based on buyer's location. 1971 Strato Vent water valve Nos in the box. Part # 3579173 Fits 1971-3 Plymouth Road Runner GTX Satellite and Dodge Charger R/T Rallye and Super Bee models with the Strato vent option. It works perfectly and stored for decades. Typical storage flaws in plating but still looks great. I have had 5 of these and they all look the same as far as the plating. Perfect for that serious 100 point restoration. Very Rare & Not reproduced and the only other 2 available are $380 Jimmy Boros & $450 from Great Lakes NOS. Parts are located in SE PA.
Can send more pictures if interested. Thanks for free ad MOPARTS! Last edited by QuickBpBp; 01/28/19 08:35 PM. Nice used "971" 73-up B-body Big Block 400 and 440 Oil Pan. It's in very nice original condition still wearing the factory blue paint no dents or hammer marks. Has one edge that may need tapped down(easy fix). The baffles have not been cut like some end up. It will sand blast and clean up nicely. Stored for decades.